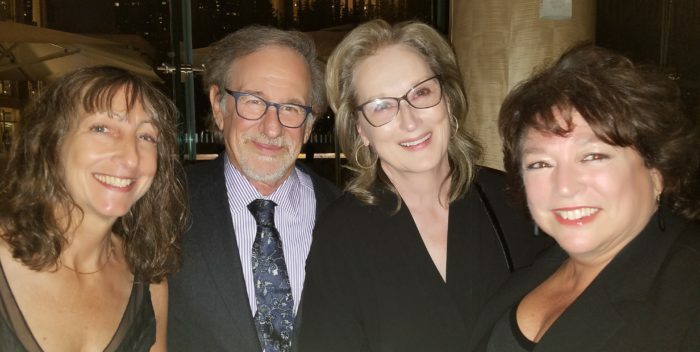 Last night, Meryl attended the premiere of HBO's documentary "Spielberg." While this may not be particularly momentous news, I'm commenting on it because it adds to the buzz surrounding Spielberg's upcoming film, The Post, which of course stars our girl. The documentary is set to air on HBO tomorrow night (October 7), and I'm not sure if Meryl will be in it. She did briefly work with Steven in a cameo voice role in 2001's A.I. Artificial Intelligence. I'm guessing the documentary was primarily produced prior to their pairing for filming The Post this summer, but I have a feeling that Meryl will be included, thus her presence at last night's premiere. Still desperate waiting for that trailer. How are they going to do her hair as Donna? I was intrigued to learn her Madeline Ashton hair was a wig. Roy really is a magician! Can't wait for the early reviews of The Papers.. I'd love to just get at least a teaser trailer. Reviews are going to be a while. And don't forget, it's now officially titled "The Post" again. I know! Everyone else seems to already be in Croatia filming. Although, Meryl's contract might just be for a certain number of days each week of filming, even if she is in a decent portion of it. Excellent comment from Meryl regarding Harvey Weinstein. Interesting too that she felt he was exasperating. Given his reputation for being heavily involved in editing I wonder how Meryl found his influence over how The Iron Lady and August: Osage County turned out. I'd love to know her true feels about how she would have different versions of her work or indeed how much control she is allowed..
First look at "The Post"